This is an easy technique, you simply use your Stampin' Write markers and colour on your stamp instead of using an ink pad. This is a great way to get different colours on one stamp, as I have done on this card. I used Night of Navy for the flowers, Lemon Lime Twist for the grass, and Early Espresso for the soil at the bottom. Just remember to 'huff' on your stamp after you colour it to ensure the ink is moist before you stamp with it. I love the way the dark Night of Navy card stock makes the Lemon Lime Twist card stock really pop. I also used the Hexagons embossing folder to add some extra texture to my Night of Navy layer. 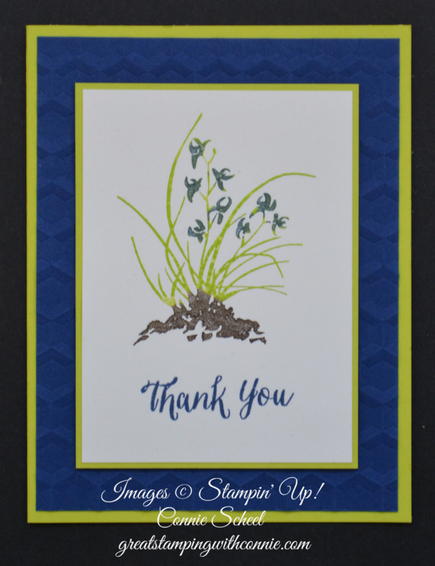 I love the sentiments in this set, but I needed a simple Thank You card, so the sentiments from this set will have to wait for another card!